This one recipe for garlic rasam may become your favourite because of its aromatic satisfying awesomeness. 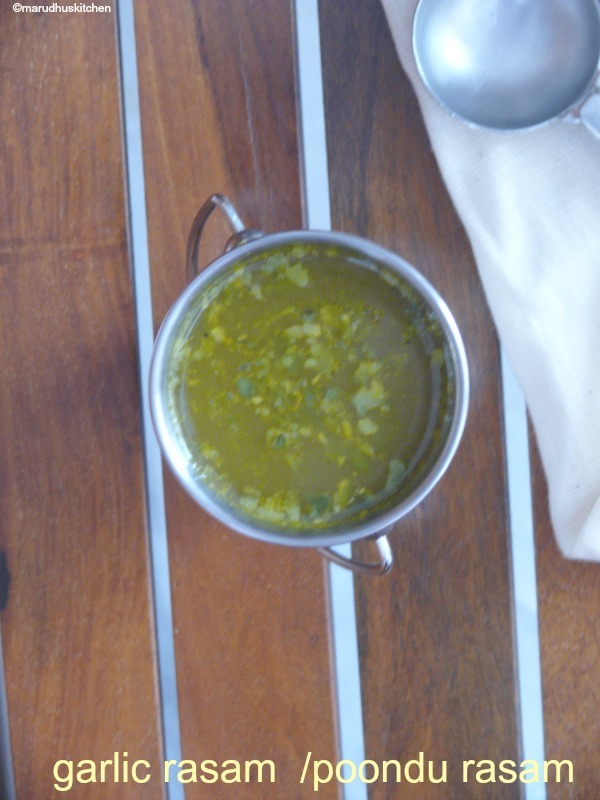 Already I have a much similar pepper rasam recipe here in my blog resembling this recipe for garlic rasam. But,for this pondu rasam the method and ingredients differs and as the name suggests with lots of garlicy goodness.When selecting garlic I usually use only organic variety which is very tasty and flavourful. The bigger variety garlic may be easy to peel but this one is worth to use and its demandingly satisfying for me in person.As we are using both tomato and tamarind just check for the tanginess of the tamarind and then adjust accordingly.If you want this rasam to be spicy don’t be fussy add more chillies according to your need.This recipe for garlic rasam is simple to do but it’s very comforting rasam that you will never regret. 1.First soak tamarind and take extract,keep ready. 2.Grind the “to grind” ingredients by adding little water to a paste. 3.Keep a kadai with oil add mustard to splutter. 4.Add red chillies with asafoetida then the tomatoes. 5.Add needed salt for the rasam,so that tomatoes cooks and mushes down quickly. 6.Add the ground paste and let it cook for some time till the rawness goes off. 7.Add little jaggery while cooking. 8.Now add extract, check for salt and if needed adjust. 9.Now add turmeric powder and stir in. 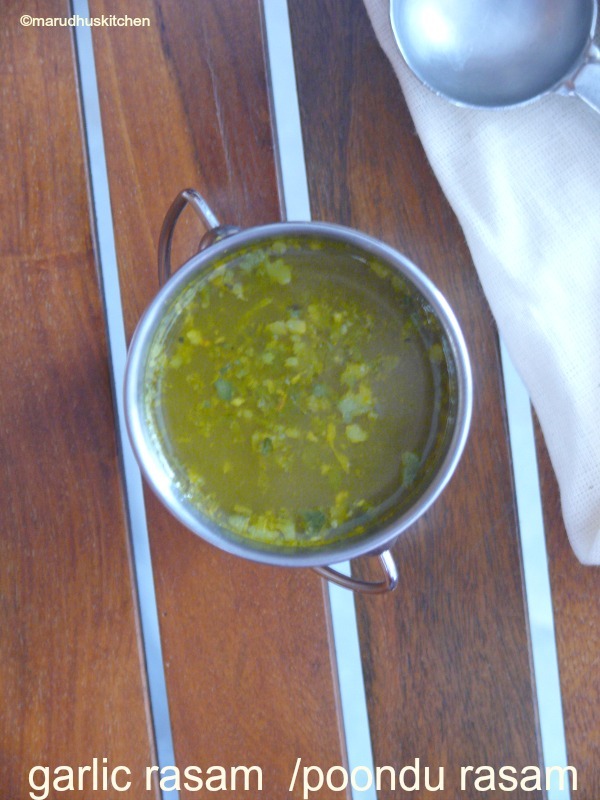 10.When rasam boils the froth will form,now add coriander and some ghee ,switch off. 11.Don’t leave the rasam to boil for too long. First soak tamarind and take extract,keep ready. Grind the to grind ingredients by adding little water to a paste. Keep a kadai with oil add mustard to splutter. add red chillies with asafoetida then the tomatoes. Add needed salt for the rasam,so that tomatoes cooks and mushes down quickly. Add the ground paste and let it cook for some time till the rawness goes off. Add little jaggery while cooking. Now add extract, check for salt and if needed adjust. Now add turmeric powder and stir in. When rasam boils the froth will form,now add coriander and some ghee ,switch off. Don’t leave the rasam to boil for too long. Check for tanginess as we are adding tomatoes also. I have added one country and one Bangalore variety tomatoes for this rasam. I have used organic garlic which is very flavourful. Use of Jaggery is optional.